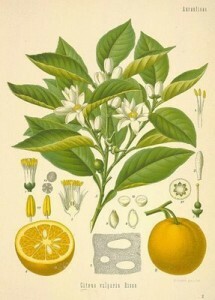 It's no surprise (if you've ever smelt this essential oil) that Neroli oil comes from the bitter orange tree. To create the oil flowers are picked in Spring and early Autumn then water distilled. The result is a powerful yet still light sweet floral aroma. The orange tree is native to China but many Mediterranean countries have been growing this tree for centuries, cultivating it for its highly used perfume purposes. A well-known toner for the skin, orange flower water helps to revitalise dry and mature skin. Often used as an ingredient in facial oils, body washes, scrubs and hair products it's not too difficult to find a natural, organic skin care product containing the uplifting essence of Neroli. It is also good for smoothing wrinkles, minimising broken capillaries and preventing stretch marks. Orange Blossom and Neroli Soap by Simply Soaps is Sam's favourite; in her words ‘wonderful'. Massage and aroma therapists use Neroli to calm and uplift - the dual affect seems paradoxical but it does actually work like this. As one of the most effective anti-depressant oil Neroli relieves anxieties by calming the nervous system. If you suffer from digestive cramps try taking a bath with a few drops of the oil - Neroli has antispasmodic properties, which help to alleviate pain.